If you’ve upgraded, or moved PCs, from Windows XP to Windows 8 or even Windows 10, then you may have lost one of your crucial pieces of software: Outlook Express. 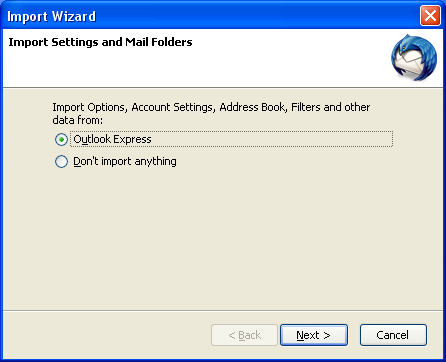 For years Outlook Express was the most popular email program, used daily by millions of people. But Microsoft saw fit to ditch it in favour of Windows Mail and then Windows Live Mail when Vista was around. Now we have the much disliked Windows Mail App, which has a full screen interface, and touch-friendly features (even if you’re using a non-touch computer!). So how do you escape being forced to use something which doesn’t do what you want any more? 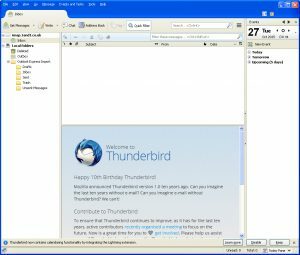 It’s time to ditch Microsoft’s products and try Thunderbird, an email app which will free you from any future operating system woes. To transfer all your email account and mail folders from Outlook Express on an old PC to Thunderbird on a new one, the easiest way to start is to install Thunderbird on the old PC. Then you can transfer your mail and settings from Outlook Express to Thunderbird, with the second step of moving Thunderbird to the new PC. This is definitely the easiest method. First make sure Outlook Express is not currently running. 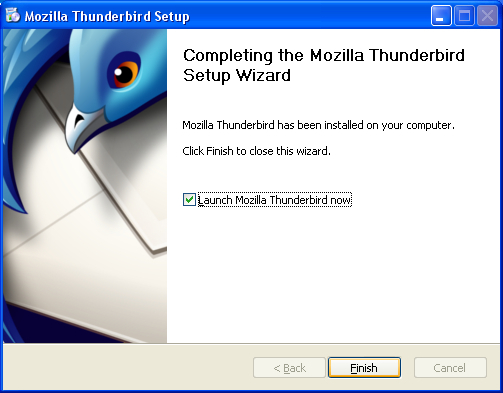 Download the Thunderbird email program from the Mozilla website, and install it in the usual way. When asked whether you’d like Thunderbird to run, keep that box ticked and click ‘Finish’. Thunderbird will open a new window and ask you whether you’d like to import settings from anywhere. Click on ‘Outlook Express’, and follow the instructions by pressing ‘Next’. Thunderbird will now pull in all your emails from Outlook Express, along with your email account settings, though you’ll need to tell it your password for each email account you’re importing. Sometimes Thunderbird doesn’t manage to transfer your settings along with the email folders. If you find yourself stuck in this position, you’ll need to transfer the settings manually. 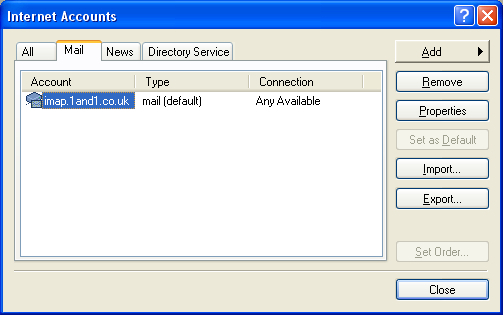 Check your Outlook Express settings by going to the Tools menu and selecting ‘Accounts’. Click on the account you’ll be transferring to Thunderbird and then click on the ‘Properties’ button on the right. The small window that opens will give you all the details you need. Even if you don’t understand all the settings, you should be able to spot which bits in Outlook Express go in which boxes in Thunderbird. Now open Thunderbird (still on your old PC). If you’re opening Thunderbird for the first time, it may take you through the steps to adding a new mail account. If not, you can follow the steps the manually add a new account on the Thunderbird website. When it asks for certain details, you can copy them across from the Outlook Express window. Open your file browser, and go to C:\Documents and Settings\<Windows user name>\Application Data\ if you’re on Windows XP. 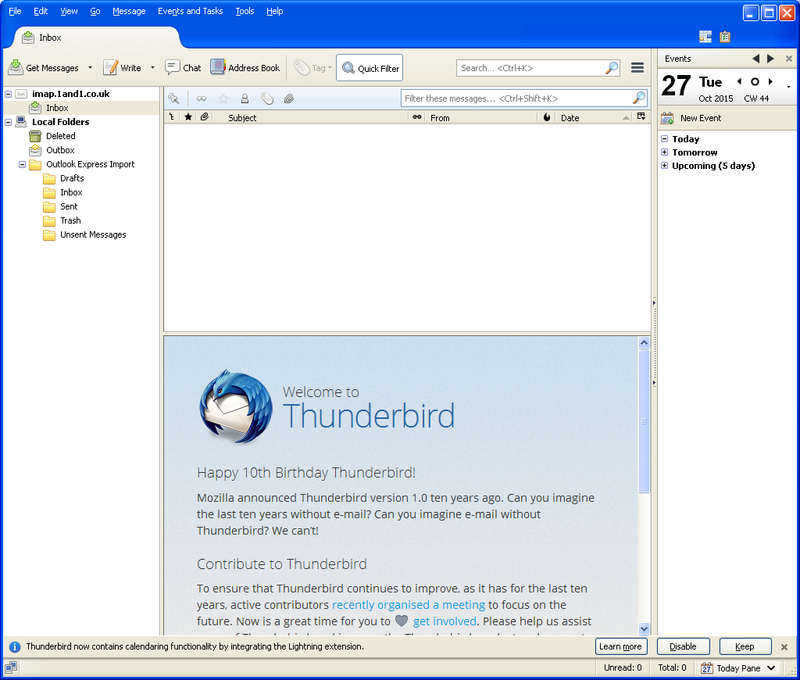 Install and open Thunderbird on the new PC. Then close the software again (we’ll see why in a moment). Bring the USB stick to the new computer, and use that PC’s file explorer to go to C:\Users\<Windows user name>\AppData\Roaming\. As long as you’ve opened Thunderbird at least once, there will be a folder called Thunderbird here. Open that folder, as well as the Thunderbird folder on your USB stick. In both folders you’ll find a folder called ‘Profiles’. Simply delete the one on the computer, and copy and paste the one from the USB stick in its place. When you open Thunderbird now, all your email accounts and folders should be there waiting for you! One last thing you may need to do is to drag your email folders from where they were imported to the new email Inbox. In the image below, you would just need to drag all the folders under ‘Outlook Express Import’ onto the ‘imap.1and1.co.uk’ folder. Optionally, you could then drag all the emails from the imported Inbox into the proper Inbox at the top. Then delete the imported Inbox. It’s highly recommended not to open Outlook Express any more after this, as it might download new emails which would never make it into your brand new Thunderbird setup. In future, if you ever need to transfer your emails to another new computer, you can simply follow these final steps to transfer that Profiles sub-folder from one Thunderbird folder to another. Of course, these steps won’t be easy for everyone. And sometimes there’s an advantage to having someone who can help you recover if things go wrong. So if you need a hand with this process, use the Contact page to send me an email, or phone me on the number you’ll find there and I’ll do my best to help you!